Spend your next vacation with us! 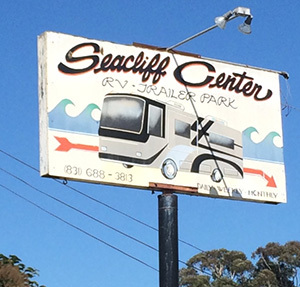 Seacliff Center RV Park has daily, weekly, and monthly rates. Seacliff Center RV Park is located near Seacliff State Beach by the historic S.S. Palo Alto cement ship that once floated offshore as an entertainment vessel for dining, dancing and fun, now permanently moored at Seacliff California State Beach. Today she remains at Seacliff Beach and serves as an artificial reef and eco system for marine life. Fishing on the pier is allowed without a license. The City of Aptos is a laid back California Coastal Community close to the regional shopping centers of Rancho Del Mar Center and Deer Park Shopping Center and is just a few miles apart from eachother along picturesque Highway 1.